NEW YORK, NY--(Marketwired - Sep 30, 2015) - Pinot Grigio from Alto Adige is anything but ordinary! The Alpine air and sunny microclimate produces wines bursting with notes of white flowers, lemon, apple, and pear. While Pinot Grigio can be considered bland and boring, Alto Adige Pinot Grigio offers spice, bright acidity, and minerality from the limestone and slate-based soils. Pinot Grigio from Alto Adige is renowned by sommeliers the world over for its complexity and outstanding quality. Located in the heart of the Dolomite Mountains, between Austria and Switzerland on Italian soil, Alto Adige's Pinot Grigio grapes achieve higher levels of acidity than anywhere else in the world. Over three hundred days of sunshine with wide day to night temperature swings allows the grapes to fully ripen, producing aromatic wines with richness and fine texture, not to mention mouthwatering acidity. Yields in Alto Adige are even lower than DOC requirements, showing that producers here take their Pinot Grigio very seriously, and the variety accounts for over 11% of the region's annual production. Give Pinot Grigio another chance and surprise friends and family with this classic yet complex wine from the Italian Alps. The Alto Adige Wine Board was formed in 1975 by a group of winemaking companies to promote and strengthen the image of the wines from Alto Adige. The promotional campaigns are implemented by the Export Organization South Tyrol (EOS) of the Chamber of Commerce Bolzano on behalf of the Consortium of Alto Adige Wines. 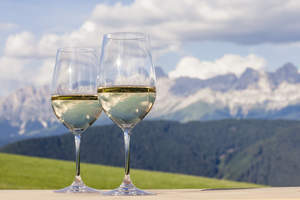 The Alto Adige Wine Board is active in Italy, Germany, Austria, England, Benelux, Switzerland and in the United States. The objectives of the PROVIT campaign, co-financed by the Italian State and the European Union, are to increase overall awareness of the DOC wines from Alto Adige, demonstrate their versatility with a wide range of foods, and showcase the diverse palette of wines that emanate from such a unique winegrowing region.